Johntimothy has a daily practice that we'll share with you today. 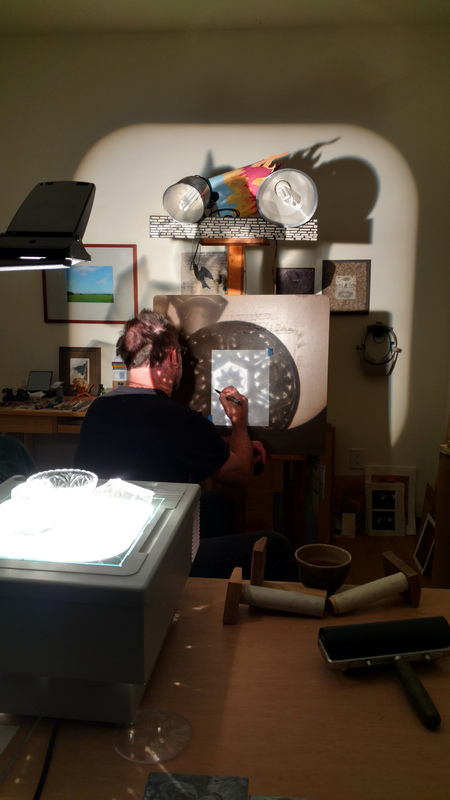 As seen in the photo above, he makes "trace drawings" from the reflections of the light passing through glass. In playing with the arrangement of objects and tracing the lines in the reflections, he creates beautiful abstract drawings filled with pattern and wonder! I asked him a few questions about his daily practice so he could share some of the process with our readers. Your daily drawings are the result of the play of light and shadows on glass. How did you come to use this process? For the longest time, I have been captivated by shadows and reflections. It was early on in my time in Sarasota, now decades ago, that I first traced the reflections from a water glass on a cloth tablecloth at a holiday function. I enjoyed the translation of the image into line. Since that time, I’ve played with these trace drawings off and on. Now, that I am on sabbatical for the semester, I decided to reengage with the idea more in depth as a basis for a daily practice. 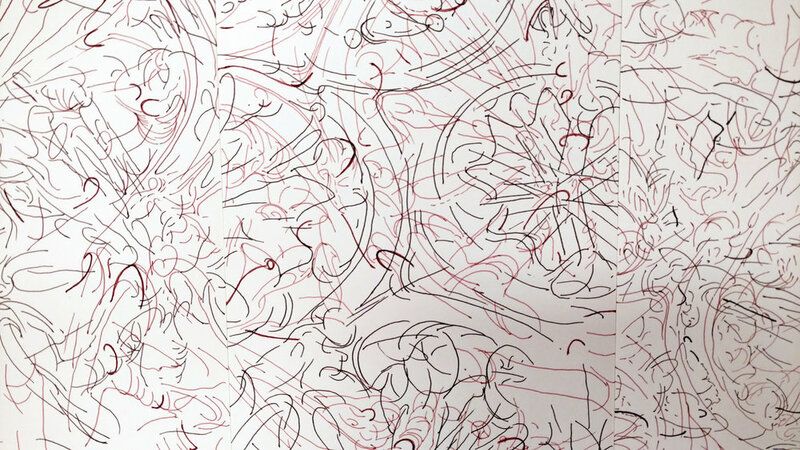 What do you enjoy the most about the process of these trace drawings…or what do you find most satisfying? It’s an image, but not an image. It’s actally an image from the external world, but abstract. Someone looking at these drawings would not know that they are drawings of the reflections of light passing through glass. There is a meditative quality to drawing them and that was part of what drew me to making them. In one sense, I don’t have to think about it and I can just be in the moment, with the drawing. Partly, I hoped this process would help me find a direction for my work. When they are all laid out in a line on the floor…it is kind of fun. They are a timeline, a visual timeline. I am fascinated by how they flow together and part of that is because of the repeated lines and marks of the drawn shapes. Do you see these drawings as an end in themselves or do you find yourself visualizing them translated into prints? No, I don’t see them as being anything more than what they are at this point in time. That would be a forced thing, so I am happy with them just being what they are.